In today’s session of the IPSI Bologna Symposium we had the pleasure of meeting and learning from Wilbur Perlot, the Deputy Director of the Clingendael Institute, a Dutch Institute of International Relations. Mr. Perlot, whose expertise includes international and peace negotiation, intercultural communication, and bilateral and multilateral negotiations, provided the participants with insight into International Negotiation and Mediation. Using his extensive knowledge in negotiations, Mr. Perlot combined thrilling anecdotes with practical tools on how to negotiate successfully. During our first day with Mr. Perlot, we were taken through a “simple” ranking exercise, which we soon learned was anything but simple. Some groups chose to abstain entirely based on the moral dilemma of ranking strangers according to their actions; others completed the exercise but chose different ranking criteria only to arrive at an entirely different end result. Leaving the room for lunch, one could feel the tension, uneasiness, and unsettled differences that were created as a result of such a “simple” task. Returning with bellies filled with gnocchi and espressos, we debriefed from the ranking exercise. 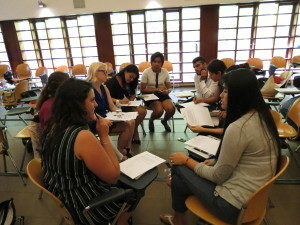 We learned that minorities can play a vital role within negotiations. Details, such as body language, tone, and framing, can also greatly affect the success of any negotiation. Mr. Perlot further accentuated the sensitivity of negotiations by noting that psychology can play a very important role during negotiations to the point of making or breaking the efforts. We learned that tensions during negotiations can not only come from a disagreement on the substance of the negotiation, but also from the psychological cues and processes that take place within the room. The second exercise will have us divided into groups of 6, for which 3 represent Uganda and the other 3 the World Bank. We are required to simulate a negotiation for which each party has demands and goals, which differ from the other party. Meeting with my teammates for the last hour of the day, we discussed our stance and needs, preparing our position and demands within the negotiation set to take place tomorrow.and unsettled differences that were created as a result of such a “simple” task. It becomes very clear from the past few lectures that as future peacemakers, we must not only master the art of negotiation, conflict diagnosis, and conflict prevention, but also the intangible skills of empathy, compassion, and authenticity. In order to build peace, we must get to know our personalities, find peace within ourselves, and develop empathy towards others who may hold conflicting worldviews. Mr. Perlot emphasized this last point by noting “our interconnected world makes empathy even more important now than 30 years ago”. The dynamics and fluid characteristics of our contemporary world require us to be just as dynamic and fluid in the work we do. 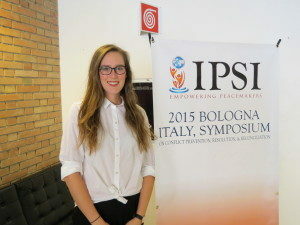 It is not only the knowledge and expertise of the IPSI Bologna Class of 2015 – which I must say is inspiring beyond words – that makes us the future of peace, but our interpersonal skills, compassion, and kindness towards another that have the ability to transform conflict and shape the future.